The fully autonomous Smart Vision EQ Fortwo debuts next month. Earlier this year, Daimler announced plans to develop a self-driving, car-sharing system with fully autonomous vehicles geared towards city living. Today, the company says that the first part of that vision -- Smart's Vision EQ Fortwo concept vehicle -- will be presented at the 2017 Frankfurt International Motor Show next month. The EQ Fortwo is a level five, fully autonomous car with no steering wheel or pedals. Via an app, riders can hail the car and have it pick them up from wherever they like. The outside of the car has a panel in the front that can display information like who it's picking up, that it's on its way to a pickup or information for pedestrians crossing in front of it. The side doors, which open upwards over the rear axle, can also display information like weather or news updates. Inside the car, there's a large screen that can display various things depending on the riders' preferences and a lounge-like bench that can seat up to two people. The EQ Fortwo's functions can be managed with a phone or with voice controls. If a single rider is open to sharing the car with a stranger, the vehicle will suggest an additional passenger based on their location to the original trip's path as well as information from both riders' personal profiles. 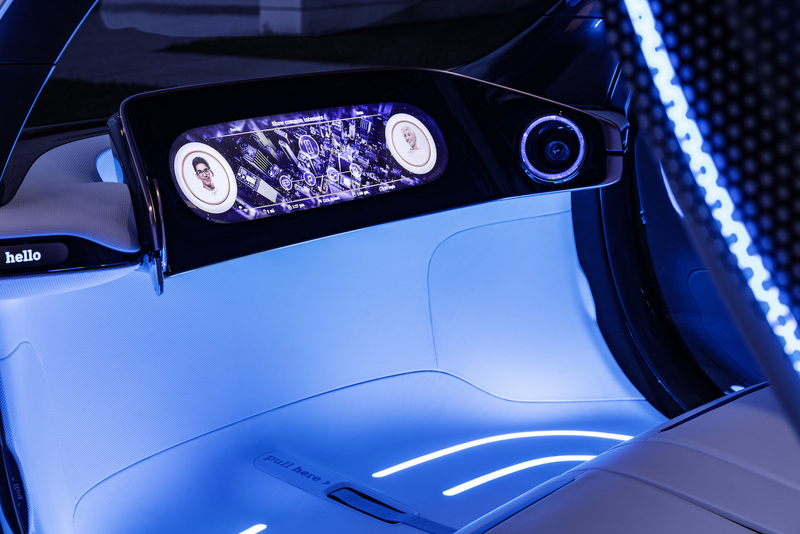 Once two passengers are in the car, the interior display will show interests shared by both, such as concerts they both went to or sports that they both enjoy. Daimler says that over ten new electric cars are scheduled for production by 2022 ranging from small Smart cars to larger SUVs. "The Smart vision EQ Fortwo is our vision of future urban mobility; it is the most radical car sharing concept car of all: fully autonomous, with maximum communication capabilities, friendly, comprehensively personalisable and, of course, electric," Smart CEO Annette Winkler said in a statement.